Hot Topic Downtown Stuart is Open! 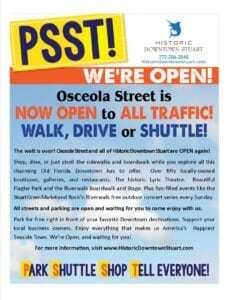 Osceola Street officially reopened this morning. Come on Downtown and see the progress on the streetscape project. It’s not quite done yet, but you can drive and park in front of all your favorite shops, restaurants, and attractions again.